95 days until the Boston marathon. Oh man, that's just 3 months from now! This isn't that much time from a marathon-training perspective. I went for a lunch-time run today, as it was my only chance to run. I left the lab where I often work in Old City, and jogged to a park that is near its center. The park is features an extinct volcano, and shear rocky outcroppings, referred to as crags. These are visible from my office window, so I thought a run up to them would be fun. I left my building, crossed a few streets, and heading into the park. I followed a trail and made my way to the base of the crags. One one side they are shear rock faces; on the other they are steep grassy slopes. I ran up the slopes, and gained a view of Old City. 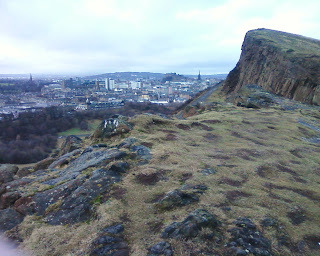 I made my way along the crags, and then descended to the road that runs around the park. The road through the park was mostly closed to cars for about half of its length - so it was perfect for running. I was warm and so removed my gloves and head band. It was one of the warmer days we've had in the past month and a half - probably near 40 F.
I ran around the park, and then headed back to work. I was only planning on running for 40 mins or so, but ended up taking 50. Back at work I had a quick shower, and joined a meeting that I was planning on attending about 10 minutes late. But I'd got my run in.